Thursday, August 8, 1912: Hardly worth while and not worth the effort. Since Grandma didn’t have much to say a hundred years ago today, I’m again going to go off on a tangent. I’m always intrigued by what happened to the friends that Grandma mentioned in the diary. I recently found a picture of one friend, Rachel Oakes, when she was an elderly woman. (She’s the one on the left.) It was taken in 1978 at a Red Hill School reunion. 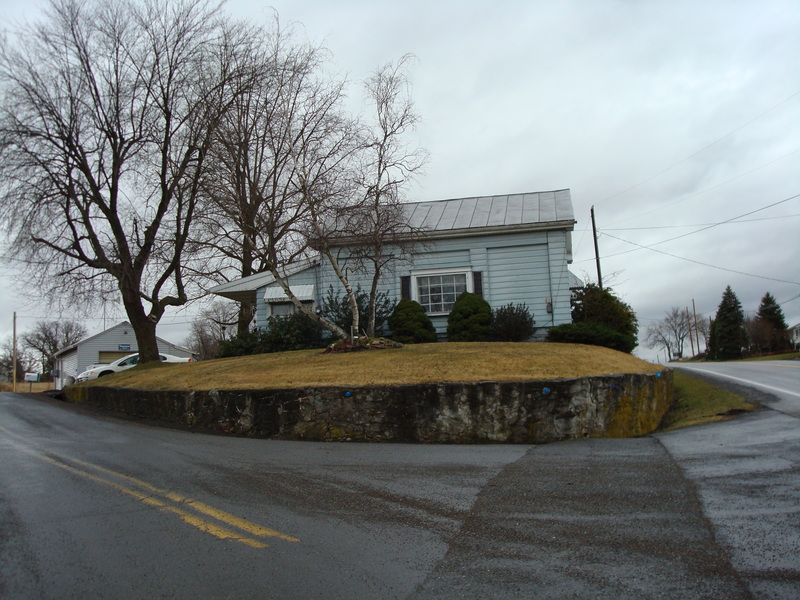 Red Hill School was a one-room school located at the southern end of McEwensville. 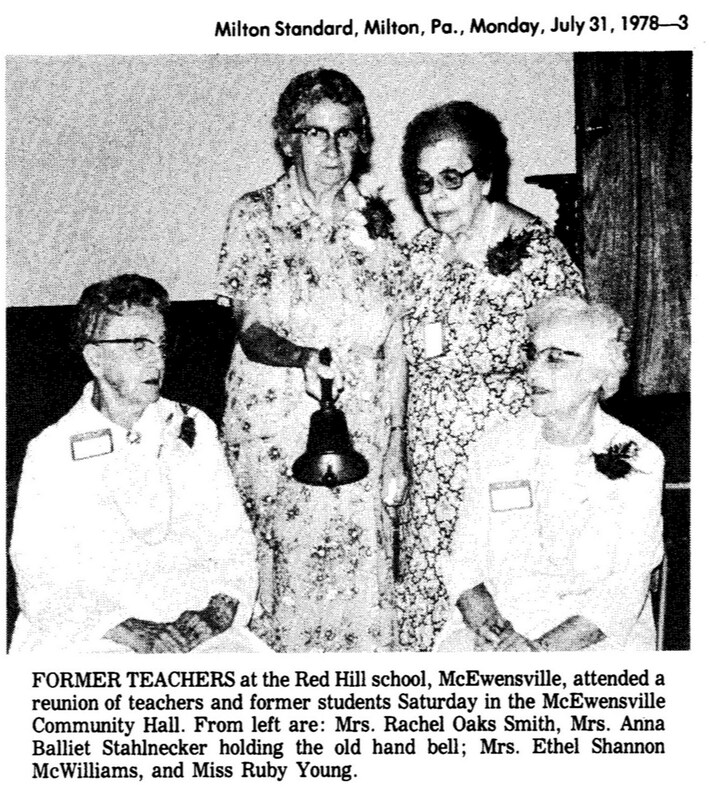 According to the History of the McEwensville Schools, Rachel taught at Red Hill School during the 1909-10 school year. 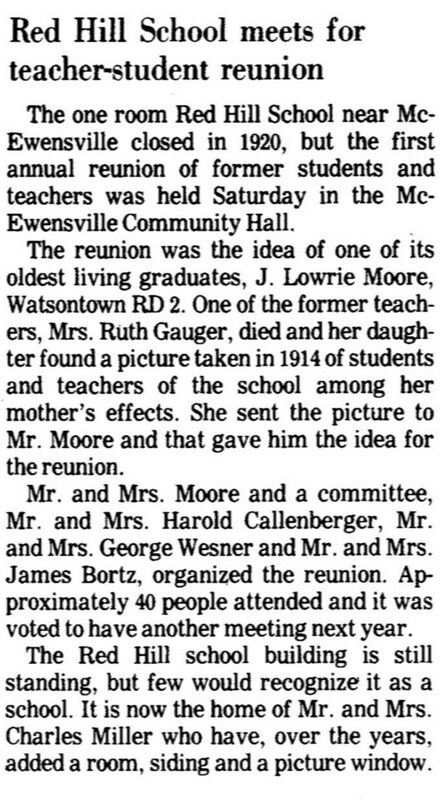 Later, during the 1910-11 and 1911-12 school years, she was the primary school teacher at McEwensville School. I suppose that it was considered more prestigious to teach at the larger McEwensville School. Note that the article mentions Ruth Gauger—that was Grandma’s sister Ruth’s married name. According to the History of the McEwensville Schools, Ruth taught at Red Hill School during the 1914-15 school year (and her other sister Besse taught there from 1906-09). Recent photo of building that once housed Red Hill School. It is now a home. Posted on August 8, 2012 August 8, 2012 by SherylPosted in McEwensvilleTagged 100 years ago, family history, genealogy. Did your great grandmother like going to school in a one-room school? It must have been really different from students’ experiences today. I think she did. She always recalled one particular day, when they had to line up and in tern spell whatever word the teacher gave them. She and one of her siblings would always be laughing, and were sent to the back of the line. I have a copy of one of her report cards. I’m just always amazed at how you have so many of the original buildings in this town. My dad of course went to a small, one room country school that unfortunately is long gone. It must really be neat to look at it and think, “my family went there 100 years ago”. Awesome. In lots of ways McEwensville seems frozen in time. And, the wonderful residents seem to generally re-purpose buildings rather than tear them down. Well, they’re a lot smarter than many urban planners here! Way to go! Nice touch to have a picture of some of the former teachers of the school. I also really like this picture– I was really excited when I found it. One thing that I really like about newspapers in rural areas is how they include great pictures and articles like this. Time passes. they surely look different than they did in 1911.